On Tuesday, April, 23, 2019, four intrepid explorers will be honored and inducted as WINGS WorldQuest Fellows at the Women of Discovery Awards Gala. Eighty-four pioneering women have received this honor and over $600,000 in grants since 2003. The Women of Discovery Awardees will present their research, initiatives and discoveries during the Fellows Forum, an accessible, interactive symposium for anyone seeking to better understand the world around us, advance scientific inquiry and promote environmental conservation. Our four Women of Discovery Awardees will be honored during the Women of Discovery Awards Gala. Join us for a screening of Headhunt Revisited: With Brush, Canvas and Camera, and talkback with filmmaker Michele Westmorland. This beautiful documentary film explores artist Caroline Mytinger's incredible journey through Melanesia and the power of art to span oceans and decades. In 1926, Caroline Mytinger set out on a four-year adventure to the "Land of Headhunters" in the Solomon Islands and New Guinea to paint Melanesia’s inhabitants. Eighty years later, her work inspires American photo-grapher Michele Westmorland to retrace Caroline’s journey and Papua New Guinean painter Jeffry Feeger to interpret contemporary counterparts of Caroline's paintings. Headhunt Revisited connects these artists in a story that is personal and universal, illustrating how art transcends time, genre and geography, continuing to inspire new generations of artists and non-artists alike about the importance of documenting culture and tradition. For 12 years, No Water No Life has documented African and North American watersheds and recorded the work of their stewards and scientists. The NWNL mission is to raise awareness of the values and vulnerability of our clean water resources by combining the powers of science and photography. 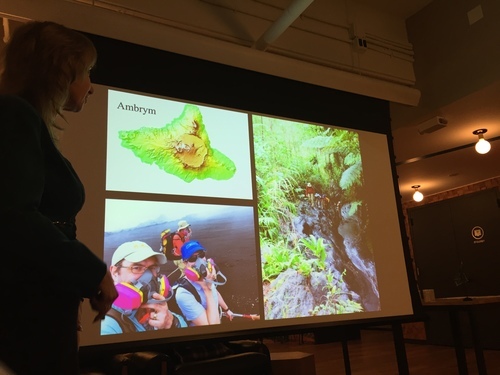 NWNL Director Alison M. Jones shared images and observations that compare and contrast two seemingly, very different basins: one created by East Africa’s Mara River in the Great Rift Valley and the other by New Jersey’s Raritan River which flows into the Hudson River. Each watershed has its own distinct geology, climate and human and animal populations. Each has its own threats. Yet each has stewards and scientists creating solutions to protect their headwaters, tributaries, main stem and terminus. 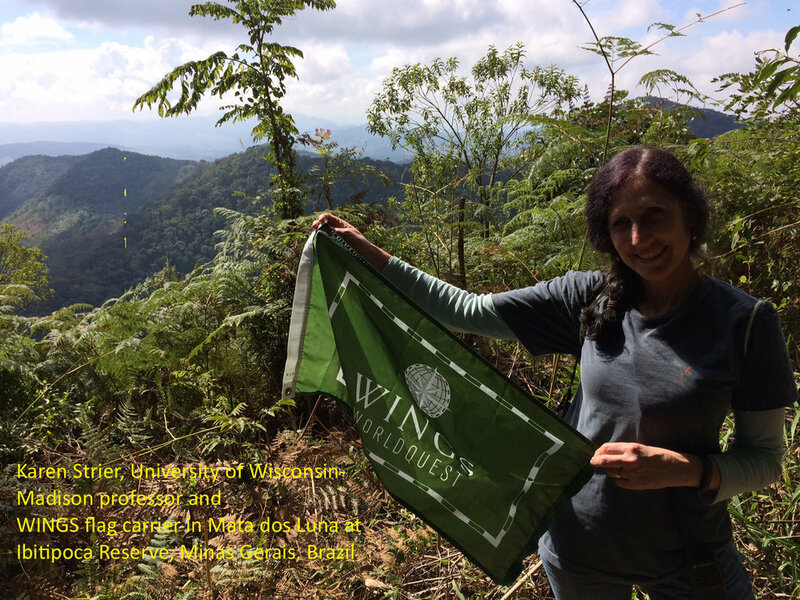 Along with other projects, Gaelin will highlight one of her latest expeditions to the Republic of Palau, where she was honored to carry WINGS Flag #30. There she documented the research of a group of scientists studying how the corals of Palau are surviving in the face of climate change. It's a glimmer of hope in the world of "gloom and doom" for corals! She will be sharing images and video from the expedition. With her work, Gaelin hopes to heighten people’s awareness and sense of responsibility to preserve the health of our planet through powerful images and film. 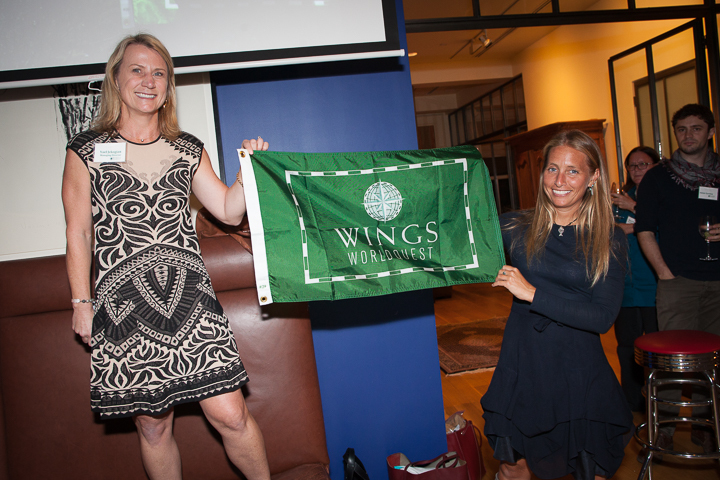 Flag Carrier Laly Lichtenfeld spoke to WINGS supporters in Greenwich, Connecticut last month. Dr. Lichtenfeld is the founder of African People & Wildlife (APW), an environmental conservation organization in Tanzania. APW's Women’s Beekeeping Initiative works with 950 women, many of whom are part of the Maasai Tribe, to help them develop entrepreneurial skills. The Women of Discovery Awardees presented their research, initiatives and discoveries during the Fellows Forum, an accessible, interactive symposium for anyone who wants to have a better understanding of the world around us, advance scientific inquiry and promote environmental conservation. The five intrepid explorers were honored and inducted as WINGS WorldQuest Fellows at the Women of Discovery Awards Luncheon. Eighty-four pioneering women have received this honor and over $600,000 in grants since 2003. Learn more about the 2018 Women of Discovery Awards. She is founder and CEO of Conservation Through Public Health (CTPH), a 14-year old nonprofit organization that promotes conservation by improving the quality of life of people and wildlife to enable them to coexist in and around protected areas in Africa. She became an Ashoka Fellow in 2007 for merging Uganda’s wildlife management and rural public health programs to create common resources for both people and animals. The March for Science was a celebration of a worldwide passion for science and a call to support and safeguard the scientific community. The mischaracterization of science as a partisan issue is a critical and urgent matter. It is time for people who support scientific research and evidence-based policies to take a public stand and be counted. The WINGS community stood in solidarity with the March for Science and continues to work to raise the voice of women in science and exploration. For more information, visit www.marchforscience.com. In 2016, Sophie Hollingsworth carried WINGS flag No. 30 to the Republic of Vanuatu, a chain of over 80 islands in the south west Pacific, to document the possible existence of a remote tribe of female chiefs. At this WINGS WorldQuest Explorer Talk, Sophie provided a unique look into a complex and diverse culture accompanied with artifacts and paintings from her expedition. She taught us about their custom dances, water music, sand drawing, and sacred pig ceremonies. We enjoyed a rare visual photographic and artistic documentation of a vanishing way of life in the South Pacific. On October 26, 2016, the 2016 Women of Discovery Awardees presented their research and life's work at the WINGS Fellows Forum at The Explorers Club. The honorees also held panel discussion to discuss the state of women in science. 2015-2016 Flag Carriers Ann Bancroft, Susan Eaton, Sophie Faustine Hollingsworth, Becca Peixotto, and Karen Strier shared their flag expeditions with the audience. After the public session, the new Fellows and Flag Carriers held a discussion with the WINGS Board to strategize the role that organizations like WINGS can play in achieving positive change for women in science and exploration. Karen Strier, Ph.D. joined us via webinar from the Atlantic Forest of southeastern Brazil to talk about her WINGS flag expedition, Saving the World's Most Peaceful Primate: Behavior, Ecology, and Population Demography of the Northern Muriqui. Dr. Strier, a professor at University of Wisconsin-Madison, is an international authority on the northern muriqui monkey. She has been studying the endangered species in the Brazilian Atlantic Forest since 1982. Dr. Strier and her research team have made significant discoveries about the behavioral ecology, reproductive biology, and life histories of muriquis that have advanced our scientific understanding of primates in general, and contributed directly to the conservation and management of this critically endangered species. Dr. Lopes, gave an informational talk about the work that she has been doing over the span of her career. She highlighted the important role that volcanoes play here on Earth as well as the importance of analyzing volcanoes on moons and planets in space. She also talked about how terrestrial and celestial volcanoes have not only impacted our scientific thinking, but have also shaped culture through human history. Dr. Rosaly M. C. Lopes is currently a Senior Research Scientist at NASA's Jet Propulsion Laboratory. Her research is centered around planetary and terrestrial geology and volcanology. In 1991, as a member of the Galileo Flight Project, a mission to Jupiter, she was responsible for observations of Jupiter's volcanic moon Io. She subsequently discovered 71 active volcanoes on Io, for which she was honored in the 2006 edition of the Guinness Book of World Records as the discoverer of the most active volcanoes anywhere. Arita Baaijens is an explorer, writer, biologist, mountaineer and WINGS Fellow. At a private cocktail event hosted in NYC this past January, Arita shared with us some of what she has learned over her 25 desert expeditions on camel throughout Egypt and Sudan. She answered questions on what she has learned from those expeditions and how they have made her a better explorer. She also shared a sneak preview of her upcoming expedition to Papua New Guinea and her plan for collecting stories and experiences. Arita was the first woman to cross the Western Desert of Egypt solo on camel. She uses storytelling as a powerful tool to reach people and create a 2-way flow of ideas, knowledge, skills and experience. Her latest book, Search for Paradise, is currently on the best seller list in The Netherlands. WINGS WorldQuest hosted "Our Ocean in Your Hands, from Science to Solutions: A Webinar" for approximately 1,000 middle & high school students from over 45 schools on four continents. Our moderator was Dr. Meghan Marrero from Mercy College and WINGS Fellows Anna Cummins and Dr. Edie Widder. You can watch the recording here. Ms. Cummins focused on the complex problem of plastics in our ocean. She told the students that they can make an impact on this issue through advocacy, thoughtful consumer choices, student research and activism. 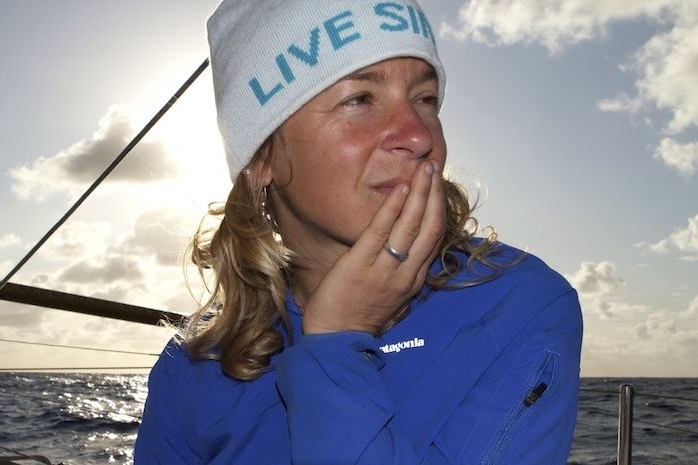 Anna's career has been focused on marine conservation and sustainability education. Her current focus is plastic marine pollution. In 2008, Anna completed an expedition studying plastic debris in the North Pacific Gyre, which inspired her to found the non-profit 5 Gyres. As Executive Director, she works to engage people and design policy solutions to end the global health crisis of plastic pollution. Dr. Widder explained how our everyday living can pollute our precious waters and showed how the students can be a part of the solution from their own computers by using her Kilroy Academy website to monitor water quality and evaluate the results remotely. Edith Widder's career centers around deep sea exploration, and currently developing tools for finding and tracking pollution. Her innovation has allowed scientists to access never-before-seen creatures of the deep ocean, and the first ever video recording of the giant squid in its natural habitat. In 2005 she founded the Ocean Research & Conservation Association (ORCA), which is dedicated to protecting aquatic ecosystems and the species they sustain through the development of innovative technologies and science-based conservation action. WINGS Fellow Bolortsetseg "Bolor" Minjin joined guests at the home of WINGS board member Diane Terry in CT on January 22 to share stories about her pivotal role in bringing the stolen Mongolian dinosaur Tarbosaurus baatar back to Mongolia. Bolor used this event to educate Mongolians about the rich dinosaur heritage of their country and is now on a quest to combat the widespread problem of fossil poaching by working with with government agencies, legal experts, NGOs and private organizations. Bolor is creating all of the partnerships necessary to educate anyone and everyone who can stop poaching and trafficking of Mongolian dinosaur fossils. Bolor established the Central Museum of Mongolian Dinosaurs where the Tyrannosaurus baatar specimen is displayed and honored with great excitement. Bolortsetseg received a 2009 Earth Award from the Wings WorldQuest and is a 2010 Emerging Explorer of National Geographic. In 2013, she was awarded a Polar Star by the Mongolian Government for her efforts to protect the fossil heritage of Mongolia. Gaelin Rosenwaks took us on a journey from satellite tagging Bluefin Tuna in the Western Atlantic Ocean to drilling ice cores in the frozen Bering Sea to her most recent expedition to the Cordillera Blanca in Peru where she was honored to carry the WINGS flag. She illuminated cutting-edge scientific research that is helping us understand the complexity of our ocean ecosystems and our responsibility in preserving our planet. Gaelin is our newest Flag Carrier and is a marine scientist, explorer, photographer, and filmmaker. She has conducted fieldwork throughout the world from the Antarctic to the Arctic on icebreakers to both the Pacific and Atlantic Oceans on fishing vessels. Gaelin founded Global Ocean Exploration, a company devoted to bringing cutting-edge ocean expedition science to the public through photography, writing, and film. Gaelin is a Fellow of both the Royal Geographical Society and the Explorers Club.